In the city that never sleeps, Rockefeller Center greets the sunrise with activities to get your blood pumping, sights to inspire you, and the perfect cup of joe to go with a morning bite. See some of our picks below to rise and shine. The Rink at Rockefeller Center: The daily 8:30am session at the Rink has a devoted following among the ice skating set. What's more, skaters of all skill levels can start at 7:30am by signing up for two-time Olympian JoJo Starbuck's "Cool Workout" series on Tuesdays and Thursdays. Or reserve ahead to pair your morning skate with a 7:45am breakfast at Rock Center Café, a deal available through November 16. Equinox: This stylish, state-of-the-art gym opens at 5am weekdays, 9am weekends, and classes such as Pilates, yoga and barre will increase your strength and flexibility before work. Steam rooms, saunas and a spa (which is open to nonmembers) are the reward. 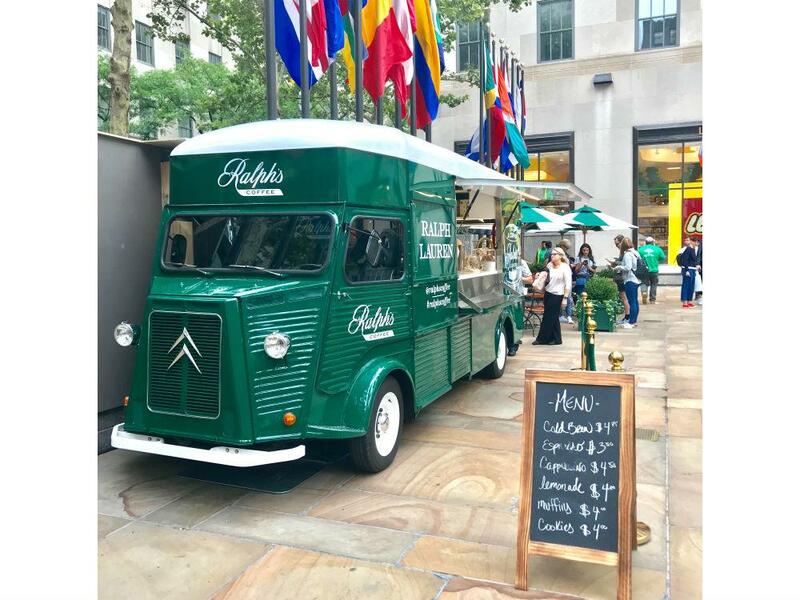 Ralph's Coffee Truck: Ralph Lauren's sleek green 1943 Citroën will be parked on the Plaza till January, serving cappuccino, espresso and sweets starting at 8am daily. (There's patio seating too.) Read about other coffee options around Rock Center, including Blue Bottle, here. Grab 'n' Go Breakfasts: Start the day with bites from Bouchon Bakery, Pret a Manger (open from 6am on weekdays), Juice Press and even Blue Ribbon Sushi Bar. 7 Best Spots for Brunch: If your Sunday mornings start on the later side, brunch at Rock Center is just your speed. Head to favorites like Brasserie Ruhlmann, Limani and Morrell Wine Bar & Café for omelets, French toast, brunch cocktails and more. Channel Gardens: Rock Center's public art is free and open to visitors at all hours, and this planted promenade, designed with seasonal installations and mythical fountainheads by Rene Paul Chambellan, is a big part of it. From November 1–15, in partnership with Christie's, the Tom Otterness sculpture "Large Bear" will be on view at the Fifth Avenue entrance to the Gardens, between West 49th and 50th Streets. Top of the Rock: For an unforgettable experience high in the sky, hit the observation deck. The first elevator goes up at 8am, letting you start the day with views across Central Park, the Manhattan skyline and points further afield. The Tour at NBC Studios: Buy tickets for the 8:20am tour, and see the late-night stages at the break of day, guided by an NBC page. (Even earlier, Today show fans gather at the crack of dawn on weekdays to watch the live broadcast through the studio windows, meet the anchors and get on TV.) Nearby, tours of Radio City Music Hall begin at 9:30am. Christie's: The doors open at 10am Monday–Saturday (1pm Sunday) at this renowned auction and gallery, which is free and open to the public. Among the major sales taking place this fall, Impressionist and Modern Art is on view November 4–11, An American Place: The Barney A. Ebsworth Collection (described as "the greatest privately owned collection of American Modernist art ever to come to market") is on view November 3–14, and Post-War and Contemporary Art can be seen November 4–15. The Art of Shaving: The Barber Spa at this specialty shop opens at 10am. Read about the experience of getting a pro shave and a haircut here. Running Errands: Get a shoe shine, renew your passport, mail packages and pick up a prescription at convenient locations in the Concourse. Since many of them open early, you can check off your list at the start of the day.